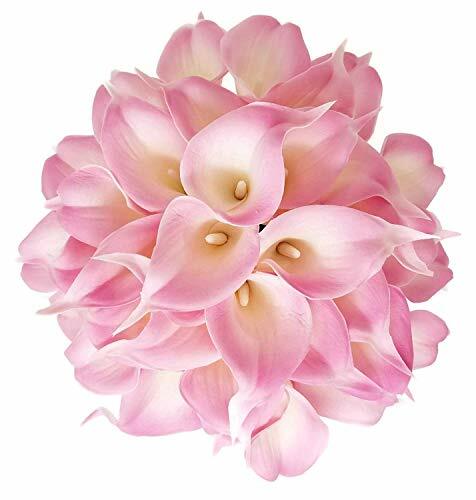 Flower Size: Total length including flower and stem: 14 inches. Flower bud approx size: 4 inches length, 3 inches across. Stems may be adjusted to your liking. Please note: The production of artificial flowers require many steps, many of which are 100% handmade . It may occur during transport that some delicate flower heads or leaves may briefly fall. If flower petals are bent, you may briefly submerge into very warm water to retain their original shape. Nothing but peony bliss! These lovely pink artificial flowers are right at home, whether they're being carried down the aisle by the bride and her court as a peony silk flower bouquet or being displayed as wedding decor on the tables at the reception. These lifelike beauties don't look like your average fake flowers, but with their vibrant color and natural feel, they bring joy to any occasion. Grace your home, both indoors and out with a nearly natural flower arrangement. These beauties dress up a window box with or without additional plants or flowers. Give your office or conference room a pick-me-up with a flower silk bouquet. They make a great party decoration and gift. Great decor for staging a home for sale. 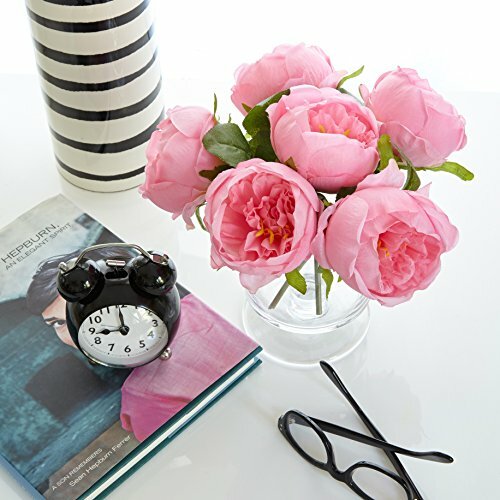 Our superior quality pink peonies are so life-like. We don't cram five flowers on one stem, but ours mimic the natural beauty of the flower, with one flower per stem. Silk flowers don't need to be watered, fertilized, weeded, etc. so no "green thumb" is required. Please allow plenty of time before your event so you can "fluff-up" each flower as they do get a bit crumpled during storage and shipping. 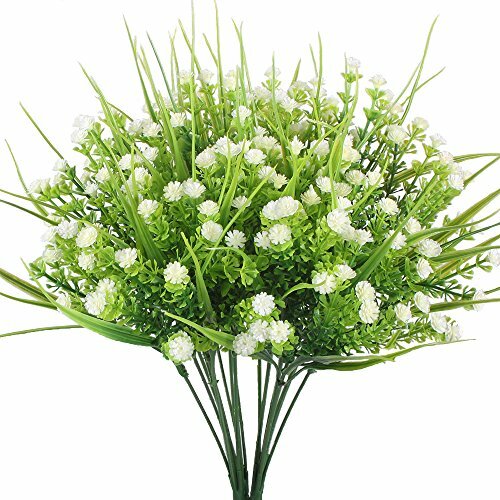 Bunch of real touch artificial Baby Breath present greenery of lush green leaves and beauty of delicate cream petal for any occasion centerpieces . 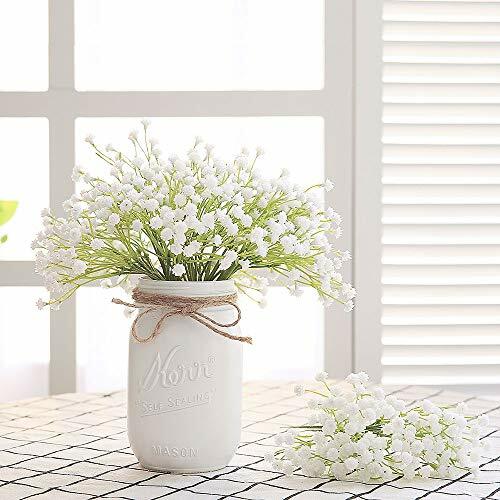 compared to real plants or dried flower, it is wired and more flexible for adjusting to get perfect presentation, perfect for DIY flower arrangements, living room, kitchen decor, dining table, bedroom bookshelf ornament. 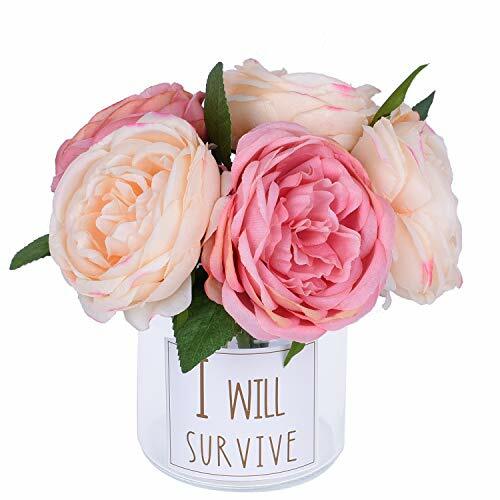 Made with UV resistant plastic, it is can be outside decor in garden, porch, party, bridal bouquets, wedding centerpiece, waterproof and reusable . Note: Since the size above is measured by hand, the size of the actual item you received could be slightly different from the size above. Meanwhile, please be reminded that due to lighting effects, monitor's brightness / contrast settings etc, there could be some slight differences in the color tone of the pictures and the actual item. Specifications: Material: The the stem is polyester over a wire center, which makes the stem easy to shape as you wish, will be a good choice for DIY décor. Flower is make of silk and the leaf is made of plastic. Weight:300 g/0.66 lb Beautiful, vivid and lifelike Created from genuine plants, bright colors and vivid images. Bring your space to adorable life. Wide application Use this flower bouquet for an adorable centerpiece, or clip apart and use as filler flowers. Fits for Bridal Bouquet, Wedding Parties, Home Decorations, Bookstore, Cafe Store, Cloth Shop Party, Art hall, Office, Shop, Home, Garden and all kinds of occasion's decoration. Note: The Stems may be compressed when you receive the package ,do not worry about it , you can adjust the state after receiving, the shape will restore normal soon. Kirifly stands behind all of its products with 'One Year Warranty' and super customer service. If for any reason you are not satisfied, please don't hesitate to contact our customer service for help. 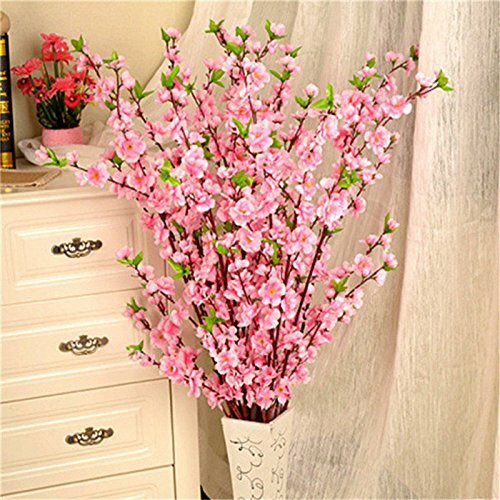 Specification: Material: Silk Cloth, Plastic stems, Iron Wire Flower Height : 32cm/12.5" (Approx.) 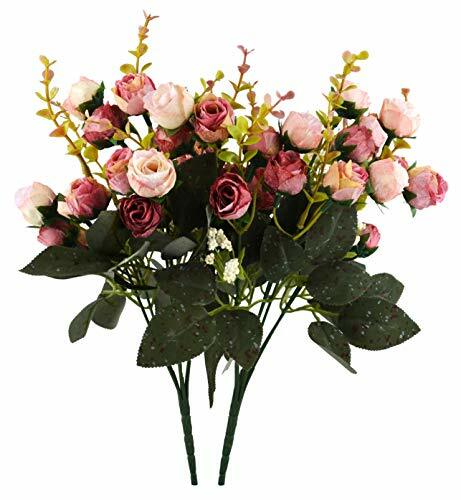 Product weight:106 g Package: 9 Heads Artificial Rose Bouquet, NO VASE INCLUDED. Warm Tips: ★Because of the faux plant is made with plastic, so there maybe will have some smell. Please put the artificial flower plant placed in ventilated place for 1-2 days if you mind. ★If you accidentally find silk fallen leaves or flower heads, you can manually insert it back onto the plastic stem without affecting the use of the fake flowers product. ★There would be accumulated dust if you put the silk flowers in a place for very long time, we suggest that you don't need to wash it by hands and don't wash too frequently. You can use the hair dryer with cold wind to remove the dust. This artificial rose flower are made by handmade and machine.The fake flowers bouquet are suit for wedding,bedroom,Meeting Room,restroom,garden,balcony,shopping etc. 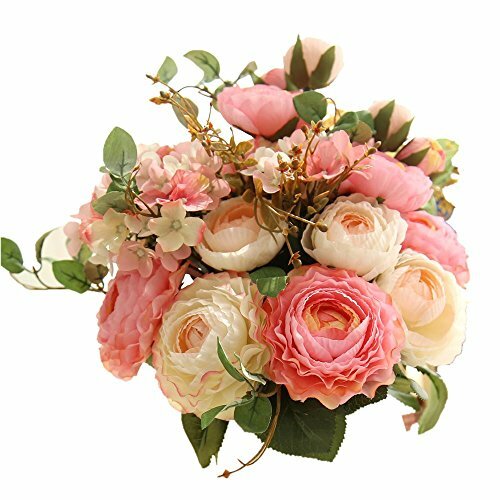 Features: Color: Pink + Coffee Material:Silk leaves, silk flower, Plastic stem; Measure:Each rose approx 1'' in diameter; Bouquet dimension approx. : 13.8" H x 8.5"W Weight: 0.11lbs/bouquet Arrangement:Best match 2 pieces rose flowers in one vase. Package: Pack of 2 fake rose bouquet Tip: 1. The flower may be a little deformed during transportation. 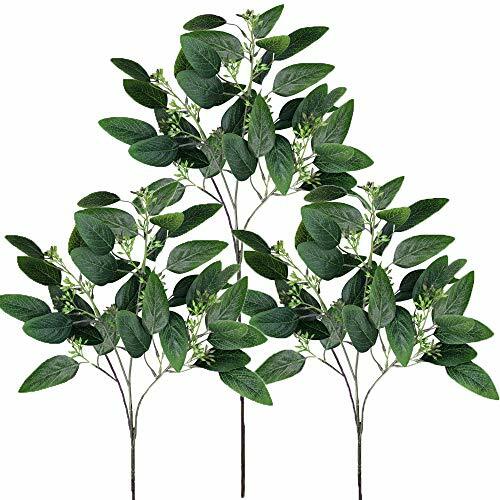 You can adjust the branches and stems height to the most natural state.2. There would be accumulated dust if you put it in a place for very long time.You can use the hair dryer with cold wind to remove the dust. 3. Don't wash it by hands. We suggest that you don't need to wash it by hands and don't wash too frequently. 4. Please don't put artificial plants expose under the sun for a long time, or they will lose their bright colors and became increasingly bleak. 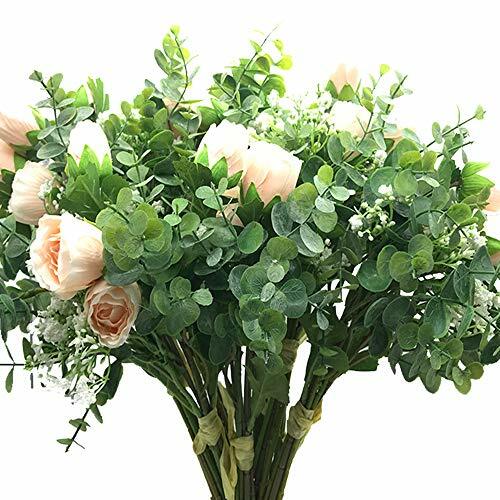 Compare prices on Floral Bouquet Arrangement at Elevelist.com – use promo codes and coupons for best offers and deals. We work hard to get you amazing deals and collect all avail hot offers online and represent it in one place for the customers. Now our visitors can leverage benefits of big brands and heavy discounts available for that day and for famous brands.